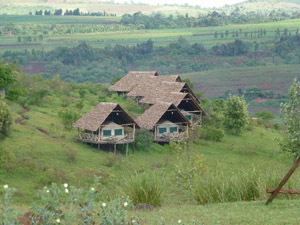 Nestled between two hills on the border of Ngorongoro Crater Conservation Area in Tanzania, Rhotia Valley Tented Camp is a special place whose mission does not end with being one of the most warm, welcoming and beautiful lodges in the country. On its website’s guestbook page, messages in four different languages sing its praises. This luxury Tanzania sarafi tours camp boasts a coveted five stars on its TripAdvisor profile with one reviewer mentioning the words “Heaven on Earth.” And even if you completely forget its special purpose, it is still one of the best safari lodges in the world. 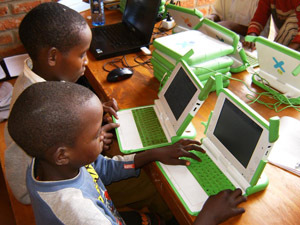 In addition to being a world-class basecamp, the property is also home to thirty six children - mostly orphans - from around the Rhotia Valley (36 as of October, 2012). Profits generated from the Tented Lodge directly support the Rhotia Valley Children’s Home, bringing the local community together under a common goal of creating a better future for local children, as well as employing many residents of the village. The lodge waits for visitors three miles off the main road between Arusha and Ngorongoro Crater, safely removed from the well-trodden path that takes so many international visitors to the best game viewing on the planet. Upon guests’ arrival at the lodge, excited greetings, welcome drinks and warm smiles are the first impression as the lodge’s staff, truly thankful for your business, meet you at your vehicle. You are immediately shown to your tent. 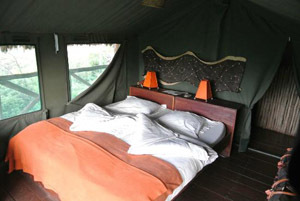 Each of the Tented Lodge’s 15 permanent tent structures was built with local materials, and include private verandas, as well as bathrooms with hot and cold running water. Meanwhile next door, thirty six children enjoy the benefits of clean water, three meals a day, clothes and a safe place to sleep. Their day begins with a good breakfast, followed by a long walk to their school in Rhotia. After a day of classes, their activities vary from playing soccer, to tending their vegetable garden and raising their chickens, to helping prepare dinner. Furthermore, the funds from the Tented Lodge and Tanzania tours to this area have helped improve the local community at large. In 2011, work was completed on modernizing a water pipeline that serves the village of Rhotia - materials provided by the lodge. The house’s conference hall also hosts classes on health, AIDS, nutrition, computers, and arts and crafts. During your stay here, you will be a short drive away from a number of Tanzania’s famous national parks, including Lake Manyara, Lake Eyasi, Tarangire and Ngorongoro Crater. The lodge itself is a relaxing haven, and casual walks, (both guided and unguided) along the nearby river and into the local village are as revitalizing as they are fascinating. Accompanied by a professional Ngorongoro Conservation Area ranger, you can walk directly into the Ngorongoro Forest from the lodge. A three hour hike will take you to a stunning nearby waterfall, and a full day hike can take you all the way to the crater’s rim and back! Of course, a unique opportunity at this lodge is paying a visit the the Children’s Home, where you can tour the buildings, meet the children, and perhaps join in on a soccer match! There is no denying that the Rhotia Valley Tented Lodge is a special place. As exotic as a Tanzania safari is, there are so many fantastic lodges in and around the country’s national parks that it becomes difficult to differentiate between them. A lodge so close to Ngorongoro Crater that also supports the local community, and local children, so comprehensively, is a thing that must be acknowledged. The Children’s Home is happy to accept monetary donations; all information can be found here. Can't get enough Africa? Are you in the very beginning planning stages of your trip? Great! We published an absolutely free travel guide to picking your perfect Tanzania safari destination. Click below to download!